http://newiprogressive.com/images/stories/S5/foxconn-wisconsin-plant-2017-s5.jpg Foxconn appears to be modifying it's end of the $4.5 billion deal with a smaller plant featuring older technology and far fewer manufacturing jobs. Here are 5 questions Scott Walker must answer on the now crumbling deal. MADISON - The Foxconn façade is officially crumbling. With several more troubling reports coming out last week about the changing details of the project, it’s time for Wisconsinites to finally get some answers from their leaders. And since this negotiation started at the top, it’s only fitting that Scott Walker be the one to answer for his botched deal. When did you know Foxconn had scrapped its plan to build the state-of-the-art Gen 10.5 factory that was committed to? This factory is much smaller and could create far fewer manufacturing jobs than the larger plant. 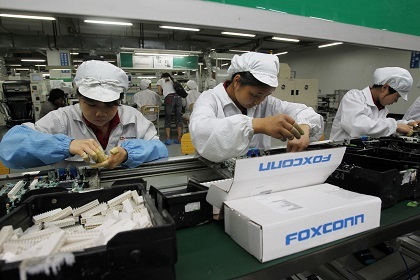 How can you still guarantee that Foxconn will meet its commitment of creating 13,000 jobs? Taxpayers have already committed to over $1 Billion in public assistance to Foxconn not tied to the creation of a single job. Do you have a plan to get that money back if they fall short of their promises? When did you know that Foxconn planned to automate nearly all of the factory jobs in this plant? Do you still think this project is creating the type of jobs Wisconsin workers are looking for? Foxconn handed out big contracts to several of Walker’s donors. Can you promise that Foxconn money isn’t being used to support your campaign in any way? This is just the tip of the iceberg. Walker has refused to speak out at all about Foxconn’s shady bait-and-switch tactics, and it’s only creating more and more questions. Wisconsin taxpayers deserve to know the truth.